[Leo Sampson Goolden] is a boatbuilder and Sailor. He’s a prime example of a dwindling group of shipwrights who build sailing vessels the traditional way. In 2017, he was given the opportunity to buy Tally Ho, a Yacht built back in 1910. Once a proud ship, Tally Ho now sat as a shell under a shrink-wrap tarp. Her deck was rotted, her keel cracked. Any sane person would have moved on. Thankfully [Leo] is not quite sane, and began a quest to bring this history ship back to its former glory. Tally Ho isn’t just an old boat. She is a 48-foot long gaff cutter yacht designed by the famous Albert Strange and built in Sussex, England. Tally Ho won the 1927 Fastnet Race (corrected time) when rough seas caused all but two boats to bow out. To say [Leo] has his work cut out for him would be an understatement. Tally Ho lived a hard life, from racing to fishing. A complete restoration was needed. In fact, it would have been cheaper and easier to build a replica rather than restore the original. [Leo] wanted to save Tally Ho though, so he bought the boat for one dollar, and began to put all his time, effort, and funds into restoring her. This work includes carefully documenting each piece as it is removed. Some of the tools and materials are traditional – such as chisels and red lead putty. But [Leo] is using power tools as well, including a custom-built chainsaw mount for shaping the keel. His videos are entertaining and illustrate many techniques of boat building. Wherever possible, [Leo] adds captions to explain the meanings of boat building terms, as well as explains the different terms used in England and the USA. In the latest video, you can watch along as [Leo] creates a Dutchman to fill in a knot in the keel. Can check that out in the video after the break. In the world of sailing, there are many records to compete over. Speed records, endurance records, size records. The fastest crossing, the longest solo journey, the largest yacht. But not all records concern superlatives, for example in the size stakes, there are also records for the smallest vessels. The Atlantic crossing has been completed by a succession of ever smaller boats over the years, and the current record from 1993 is held by the 5’4″ (1.626m) boat Father’s Day. Records are made to be broken, and there is now a challenger to the crown in the form of the impossibly tiny 42″ (1.067m) Undaunted, the creation of [Matt Kent], who intends to sail the boat from the Canary Islands to the USA in around 4 months. The boat’s design is definitely unusual, with a square aluminium hull of equal beam and length, and a very deep keel that has an emergency drinking water tank as its ballast. The sail is a square rig — imagine picture-book images of Viking ships for a minute — and it has two rudders. We are not nautical engineers here at Hackaday, but reading the descriptions of the boat we understand it to have more in common with a buoy in the way it handles than it does with a sleek racing yacht. Unfortunately the first sailing attempt suffered a setback due to a design flaw in the way the vessel’s emergency flotation is attached. This was revealed by its interaction with some unusual waves. But [Matt] will be back for another try, and with luck we’ll see him on our TV screens sometime next year as he emerges into the Florida sunshine from his cramped quarters. Meanwhile his unusual boat and its construction makes for a fascinating read that we’re sure you’ll appreciate. We don’t often cover boat building here at Hackaday. But if unusual ocean crossings are of interest, here’s an autonomous one we looked at back in 2010. Drones fill the sky raining hellfire on unsuspecting civilians below. Self-driving cars only cause half as many accidents as carbon-based drivers. Autonomous vehicles are the future, no matter how bleak that future is. One thing we haven’t seen much of is autonomous marine vehicles, be they submarines, hovercrafts, or sailboats. That’s exactly what [silvioBi] is building for his entry into the Hackaday Prize: a sailboat that will ply the waters of Italy’s largest lake. Every boat needs a hull, but this project will need much more, from electronics to solar panels to sensors. Luckily for [silvio], choosing a hull is as simple as heading over to eBay. [silvio] picked up a fiberglass boat hull for about €40 that fill fit both is needs and his workbench. The electronics are a bit trickier, but the basic plan is to cover the deck with solar panels, and use a few sensors including GPS, IMU, and an anemometer to steer this sailboat around a lake. Building an autonomous vehicle is a hard challenge, and for the electronics, [silvio] has a trick up his sleeve: he’s using redundant electronics. All the sensors are connected via an I2C bus, so why not put two microcontrollers on that bus in a master and slave configuration? It won’t add much mass, and given the problems had by a few of the teams behind robotic sailing competitions, a bit of redundancy isn’t a bad thing to have. Sailing – specifically small boats in regattas – is a hobby that requires a lot of skill. Like any hobby, there are devices and electronics to make the hobby easier. For sailing, its tactical sailing compasses and GPS units. Remember, you probably don’t want to sail in a straight line, and that means offloading decades of experience to electronics. Instead of spending hundreds of dollars on a sailing computer, [Brook] thought it would be a better idea to build his own robot sailor from a Raspberry Pi and a Pebble smartwatch. The sensors required for a sailing computer are par for the course – a Ublox GPS unit, a magnetometer, an acceleratometer, and a gyro. 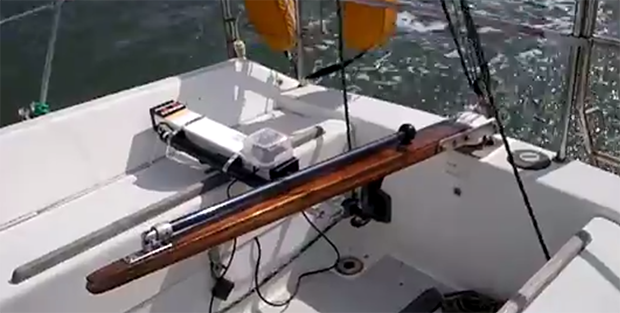 Being used on a sailboat also means there’s an anemometer thrown into the mix. These parts are stuffed into a waterproof polycarbonate field box with a USB power bank battery and a Bluetooth USB dongle. With the hardware in place, it was time to write the software. The UI for this device is a Pebble smartwatch, which means there was a lot of futzing around with C# and Mono. This device is also a sailing data recorder, meaning [Brook] can integrate this project with VisualSail, a desktop application he wrote a few years ago to create 3D replays of sailing races using GPS data. After seeing an autopilot for a kayak a few days ago, [Mike] thought he should send in his version of a water-borne autopilot. Compared to something that fits in a one-man kayak, [Mike]’s creation is a monstrous device, able to keep a largeish sailboat on a constant heading. To keep track of the ship’s bearing, [Mike] is using a very cool digital compass that uses LEDs to keep a steady heading. Also included is an amazingly professional and very expensive 6 axis IMU. To actually steer the ship, [Mike] is using a linear actuator attached to the tiller powered by a huge 60 Amp motor controller. The actuator only draws about 750 mA, but if [Mike] ever needs an autopilot for a container ship or super tanker, the power is right there. For control, [Mike] ended up using an Arduino, 16-button keypad, and an LCD display. With this, he can put his autopilot into idle, calibration, and run modes, as well as changing the ship’s heading by 1, 10, and 100 degrees port or starboard. From a day of sailing, [Mike] can safely say his autopilot works very well. It’s able to keep a constant heading going downwind, and even has enough smarts to tack upwind.